Age 83 of Owosso passed away Thursday, January 31, 2019 at Memorial Healthcare. Per Gary's wishes, cremation has taken place and there will no services. Gary was born May 25, 1935 in New Lothrop, the son of Leslie and Arlene (Biser) Wood. 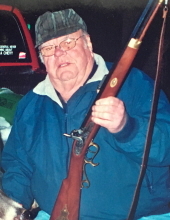 He was an avid outdoorsman and enjoyed hunting, fishing and working on race cars. Most of all, Gary loved time spent with his family. He married June Debar in Elsie on August 7, 1955; she predeceased him on October 13, 2001. Gary owned and operated along side his wife at Owosso Canvas Company was a lifelong mechanic and retired from Pleasant View where he worked in maintenance. He is survived by his children Kenneth (Kim) Wood, Cynthia (Bruce) Bitterman, Dawn (Richard) Hudecek and Colleen (Mike) Hoag; 12 grandchildren; 10 great-grandchildren; brother Jack (Suzanne) Wood; companion Ann Hinspeter; several nieces, nephews and other family and friends. Gary was predeceased by his wife June, his parents and step-mother Geraldine, brothers Roy "Jimmy", sister Janet Hall and great-granddaughter Avery Hudecek. To send flowers or a remembrance gift to the family of Gary B. "Woody" Wood, please visit our Tribute Store. "Email Address" would like to share the life celebration of Gary B. "Woody" Wood. Click on the "link" to go to share a favorite memory or leave a condolence message for the family.